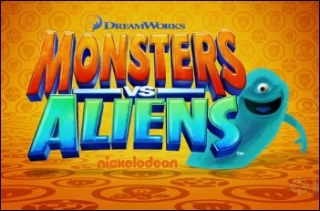 After the box-office success of Monsters vs. Aliens in 2009, Dreamworks Animation green-lit a spin-off TV series to be developed for Nickelodeon. Well, now it’s here! Monsters vs. Aliens premiered on cable TV March 23rd with a special pilot episode, “Welcome to Area Fifty-Something”. Regular episodes begin on Saturday mornings starting this weekend. B.O.B. the blob, Link the fish-man, Dr. Cockroach the bug-man, and Susan (aka Ginormica) the giant-lady just want to live a quiet life on their secret government base, but that’s hard to do when hostile aliens keep showing up — and doing things like kidnapping the President! Nickelodeon has an official web site for the show as well.